NASA's fiscal year 2019 budget proposal seeks to launch Europa Clipper on a commercial vehicle in 2025, while Congress has sought a 2002 launch on SLS. 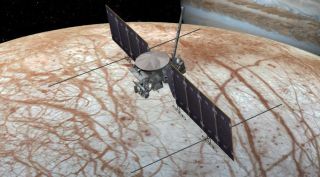 WASHINGTON — NASA's fiscal year 2019 proposal will likely set up another showdown between NASA and Congress regarding the Europa Clipper mission , debating not only when to launch the spacecraft but also how. The 2019 budget proposal, released Feb. 12, offers $264.7 million for the mission, which would send the spacecraft into orbit around Jupiter and make dozens of flybys of Europa, the potentially habitable icy moon of the giant planet. That's down from the $425 million the administration requested for the mission in 2018. Congress has yet to pass a final appropriations bill for fiscal year 2018, more than four and a half months into the current year. The mission received $237.4 million in 2017, and a House version of a 2018 appropriations bill provided $495 million to be shared by Europa Clipper and a follow-on lander that is still in an early phase of studies. That bill came out of the commerce, justice and science appropriations subcommittee, whose chairman, Rep. John Culberson (R-Texas), is a vigorous advocate for missions to Europa. Despite that funding profile, the budget proposal moves up the launch of the mission by a year from previous agency plans. "The budget allows us to pull the Europa Clipper in," said Jim Green, director of NASA's planetary science division, in a presentation at a meeting of the Planetary Science Advisory Committee here Feb. 21. "Last year's budget said we would be able to launch it in 2026. Now we have the funding necessary for us to be to launch it in 2025." Green didn't explain how the funding profile accelerates the launch, but a launch in either 2025 or 2026 would conflict with language in previous appropriations bills calling for a launch of the mission by 2022. The House version of the 2018 spending bill retains that 2022 launch requirement. NASA, in its 2019 budget request, included an alternative spending profile that would support a launch of Europa Clipper in 2022. That calls for significantly higher funding, peaking at $594 million in fiscal year 2020. "NASA does not recommend acceleration of the launch to 2022, given potential impacts to the rest of the Science portfolio," the budget proposal states. "The Administration supports a balanced science program, as recommended in the Decadal Survey." Those appropriations bills have also specified that Europa Clipper launch on the Space Launch System heavy-lift rocket under development. NASA "shall use the Space Launch System as the launch vehicles for the Jupiter Europa mission, plan for an orbiter launch no later than 2022 and a lander launch no later than 2024, and include in the fiscal year 2019 budget the 5-year funding profile necessary to achieve these goals," the House version of a 2018 House appropriations bill stated. NASA, though, is seeking to use instead a commercial launch vehicle that the agency believes will be less expensive than SLS. "The administration would also like us to fly Clipper on a commercial launch vehicle, because there is enormous cost savings, in our current analysis, between commercial and the use of an SLS," Green said. NASA has studied launching Europa Clipper on both SLS and on the most powerful variant of the United Launch Alliance Atlas V. SLS offers the ability to fly a fast, direct route to Jupiter, with the spacecraft arriving at the planet less than three years after launch. The Atlas V would take more than six years to get Europa Clipper to Jupiter, and require flybys of both Venus and Earth to do so. NASA's 2019 budget request notes those advantages for SLS, but concludes, "the additional costs of adding an SLS flight for the Clipper outweigh the benefits." It also states that SLS "will be focused on supporting the Administration's new space exploration strategy and prioritizing the return of astronauts to the surface of the Moon." An SLS launch of Europa Clipper, it notes, could not take place sooner than 2024 "without disrupting current NASA human exploration plans." The budget does not specify how much an SLS launch would cost, but the spending profile supporting a 2022 launch includes $432 million for a commercial launch. That amount, the document adds, "may be reduced as commercial offerings and pricing continue to evolve." Besides the Atlas 5, SpaceX's Falcon Heavy could also launch Europa Clipper. However, that vehicle, which performed its inaugural launch Feb. 6, may still be years away from the NASA certification required for launching Europa Clipper. Curt Niebur, a program scientist in the planetary science division at NASA Headquarters, said at the Feb. 21 meeting of the Outer Planets Assessment Group (OPAG) in Hampton, Virginia, that the agency was not ruling out using SLS or a commercial vehicle for launching Europa Clipper. "We're maintaining compatibility with a variety of options, but right now SLS is the baseline," he said. Niebur said that NASA doesn't need to make a formal decision on the launch vehicle for the mission until its critical design review. That review is scheduled for late 2019, according to a schedule chart presented at the OPAG meeting. That schedule also shows a June 2022 launch for the mission. "We continue to work to a launch as early as June of '22," said Bob Pappalardo, Europa Clipper project scientist, at the OPAG meeting. "That's what the project schedule is currently, and what we'll continue to work towards."